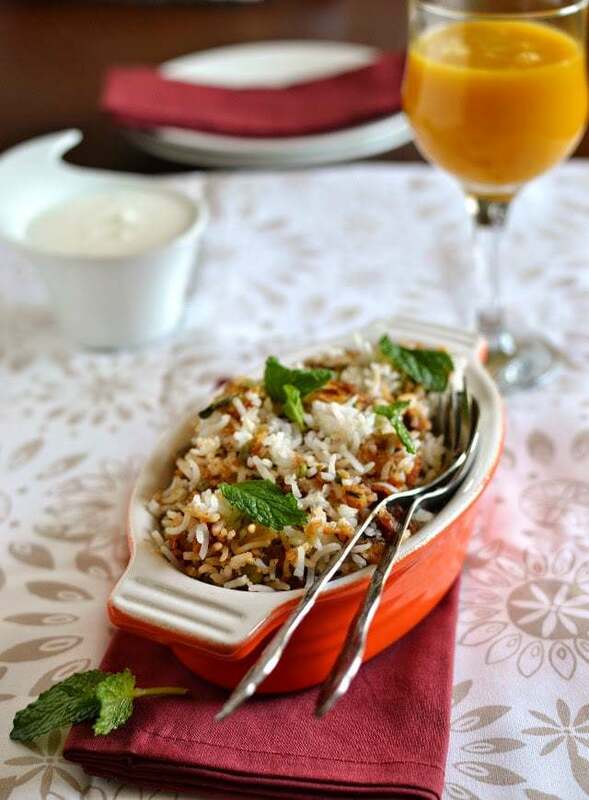 Chettinad style Vegetarian Biryani -- spicy, flavorful and delicious dish. Prep the Rice: Rinse and soak the rice for at least 30 minutes. Then boil the rice in 4~5 cups of water along with salt, 1 bay leaf, 3 cloves, 3 cardamom pods and 1" cinnamon stick. Cook until the rice is 70% cooked, about 8~10 minutes. Drain the water and set it aside to cool. Make the Masala/ Spice Paste: Heat 2tsp il in a pan; add the ingredients under 'Masala' except for coconut. Cook until the spices are nicely toasted and smell fragrant. Cool slightly and grind into a smooth paste along with coconut and little water. Make the Vegetable Curry: Heat 2tbsp oil and 1tbsp ghee; add bay leaf, cumin seeds and cook till seeds start to splutter. Add the onions and green chilies, cook till the onions are slightly browned around the edges. Add the veggies and cook covered until the veggies are tender. To speed up the process, veggies can be microwaved until tender and then added to the onions. Add turmeric and the ground masala paste, mix well and cook for 3~4 minutes. Add the tomato puree and cook for 4~5 minutes. Finally add salt and garam masala; mix well and turn off the heat. Make the Biryani: In a heavy bottomed deep pan; add 1/3rd of the rice - followed by ½ of the curry; 2nd layer: 1/3rd of the rice and the remaining ½ of the curry; final layer: remaining rice - fried onion and chopped mint and cilantro. Cover tightly with the lid and cook for 10~15 minutes. Serve hot with any raita.